The way you start your day will often influence your entire day. If you start it wrong by getting the wrong impulses and turning stressed you might bring that bad mood and irritation with you throughout the entire day. That is not a good way to start the day, so why not start it another way? Here comes some suggestions on how to start your day to make it brighter, better and more concentrated. Make yourself a cup of coffee and sit down for ten minutes without doing anything. Just think about the day, about your tasks, think about what is important and what’s not so important. Make a list of priorities and do your best to follow that throughout the day. Take ten minutes to read a book with some daily encouragement, small teaching or put on a song you love and let your strength arise as the rhythms come from your loudspeakers. If you are a Christian put on some worship and sing along. Start your day praising the creator of everything and the one who has given you this new day! This trick can not be accomplished every day, but why not start a day doing something different. Run to the local store and buy some fresh pastry for your family. They will be very surprised and happy, and in the end that will make you happy as well. You could also write a love letter to your husband/wife… guaranteed success! It can be very useful to write a diary with thoughts about life, what’s going on and what you want to see happen in your world and in your surroundings. It is always interesting to look back and see what you have written earlier and a diary helps you keep your mind on the right things. Why not combine the first suggestion with diary writing? It is very easy to start your day checking up all newspapers, see what has happened with all your friends since yesterday evening on Facebook and of course write some emails. But in the morning you often have energy and creativity which decreases throughout the day, so why not start your day using your creativity in different ways writing articles, painting pictures and meditate on Gods word. As you get tired later in the day you can read the articles, comment on status updates on Facebook and write emails to friends and family. As you start working and make your priority list as mentioned earlier, make sure to do the hard work first. It is always tempting to do the easy work first because it is easy. But if you always push the hard work ahead of you it will make you feel bad (knowing that you have a big and hard task waiting for you), and that feeling again makes us stressed and uncomfortable. Do it right away, get over it, and then you can enjoy the easier tasks as your strength starts draining. I do not have the time for this! A way of arranging this is to get out of bed earlier in the morning. 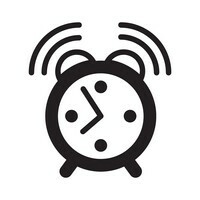 Let your alarm clock ring 15-30-60 minutes earlier and start your day in quietness and in peace. It might be hard to get up earlier, but the results of starting your day in a good way will finally give you much more energy than it will take.